The “Blog” of “Unnecessary” Quotation Marks: wait, what kind of "bags"? I wish that Laurie had also depicted the "bags" to which this refers. I am disappointed that the scratched out portion also says bags, but it's strange because I'm not sure what the error is. That kind of makes it more awesome. Just to be safe, better leave the ----- bags alone. Just found your blog! It is so hilarious. Unnecessary quotes are my recent biggest pet peeve. Next time I see a good one I will take a picture and send it to you! Just found your blog. "Love" your quotation marks. 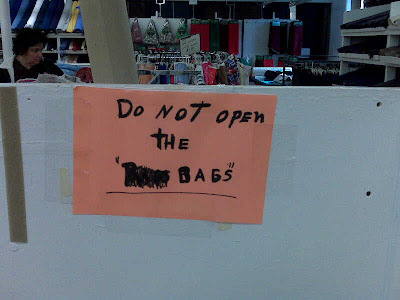 Maybe they were Bab's bags? You know Barb, don't mess with her bags. grab bags. def grab bags. I think it said the missing word is "the" because they weren't sure if "the bags" should be in speech marks or just "bags". I think it is "tea Bags"
My boss does something similar all the time and its hilarious. Every single document/piece of paper he sends my way has my name written on it twice, once scratched out.